As President of the State Bar of Georgia, I recently had the distinct honor and high privilege of being the keynote speaker for the DeKalb Bar Association’s Annual Bench & Bar Dinner at the Emory Conference Center. This year the DeKalb Bar honored Judge Clarence Seeliger, a trailblazer in Civil Rights in DeKalb County, Georgia, with its Pioneer Award. The honor was well deserved. Below are my remarks from the wonderful event. Thank you, Denise, for that kind introduction and the very nice invitation of the DeKalb County Bar Association, of which I am a card-carrying member, to be with you here tonight. I have tried two cases in DeKalb County already this year and I want everyone to know there is no more friendly and courteous courthouse than Dekalb County and it is always a pleasure to be in court here. 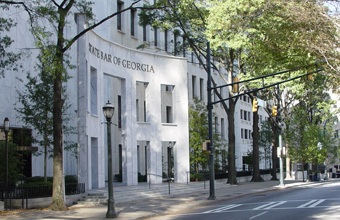 Also, DeKalb County enjoys the most diverse bench in the State of Georgia, with seven judges who speak five different languages, one of only two Asian judges in the state, and the only Hispanic. That kind of diversity is certainly something to be proud of. I see many judges here tonight, many long-time friends of mine. You are true public servants and on behalf of the State Bar of GA we greatly appreciate your service to the State of Georgia, to the citizens of GA and to our profession. We know that you take a much reduced pay to serve the State of GA compared to what you would make if you were practicing law in the private sector and we all owe you a debt of gratitude for their public service. I understand that I am a stand-in for former Justice Leah Sears, who had another engagement that popped up and she couldn’t attend tonight. Justice Sears is a true trailblazer, whom I am going to talk about tonight, and has an incredible personal story. I know I have some big shoes to fill in her absence, which reminds me of a story of a woman who appeared on Oprah years ago. This woman had bought a pair of Oprah’s old shoes at some auction, even though they were the wrong size and way too big. But she bought the shoes because she admired Oprah so much and Oprah was her role model. This woman said that when things would look down for her, when she got really depressed because she didn’t have a job, when she’s wasn’t certain how to take the next step forward, she would go in her closet and stands in Oprah’s shoes, for inspiration. That was in 1997 and now she doesn’t stand in Oprah’s shoes as often because she’s standing on her own. That’s what I feel like I am doing tonight; standing in Justice Sears’ shoes and standing in the shoes of so many other women trailblazers who led cleared the path for me and for you. Members of the Georgia Bar here tonight need to thank all those trailblazers who cleared the path for us so that we can practice law or work in our businesses with Freedom and enjoy the independence of being a professional. Our Trailblazers cleared the path for us to allow us to have it all, to experience equality in the profession and not to have to apologize for being ourselves. Tonight I want to share some thoughts with you about the extremely important issue of diversity. Let me share with you some amazing trailblazer stories, who have led the charge for racial and gender equality and diversity. Justice Ruth Bader Ginsburg- She was 1st in her class at Columbia Law School in 1959 but Justice Felix Frankfurter refused to hire her as a clerk, as was the Supreme Court’s tradition, b/c she was a woman. She was a pioneer for gender equality at a time when most people had never even heard of that term. Ginsburg recalls, “My mother told me two things constantly. One was to be a lady, and the other was to be independent.” So she started working for the ACLU, the only place where she could get a job in the early 60’s practicing law and started taking cases in which she could advocate for gender equality. Sandra Day O’Connor- Justice O’Connor only took two years, instead of the customary three, to complete law school. Along the way, she served on the Stanford Law Review and received membership in the Order of the Coif, a legal honor society. O’Connor graduated third out of a class of 102. O’Connor faced a difficult job market after leaving Stanford. No law firm in California wanted to hire her and only one offered her a position, and that was as a legal secretary. And we have our own trailblazers to thank right here in the GA Legal Community. Judge Adelle Grubbs-Cobb County Superior Court-When she was still a practicing attorney, on Wednesday before Thanksgiving many years ago, she was arguing a divorce case before a Superior Court Judge. It got to be fairly late, near 6:00 p.m. and Judge Grubbs asked that Court adjourn for the day. The trial judge wasn’t going for it, until Judge Grubbs said: “Your honor, you get to go home and relax and wake up tomorrow and enjoy Thanksgiving dinner tomorrow with your family. I get to go home tonight and clean house and polish silverware and get up early tomorrow and cook a turkey and an entire Thanksgiving Dinner after having been in Court all day today.” After that, this particular judge simply quit holding court on the day before a Holiday to be respectful to women lawyers. Chief Justice Carol Hunstein-1st woman Chief Justice of the GA. Supreme Court. Born into humble circumstances, Carol contracted polio when she was two, survived her first bout of bone cancer at age four, and lost her mother at age 11. Her adolescent years were marked by frequent hospitalizations for cancer. Carol’s father actually discouraged his six children from pursuing an education beyond high school. She married at 17, became a mother at 19, and was abandoned by her husband by age 22. That same year, Carol lost a leg to cancer and was told by doctors she had only a year to live. Struggling to find work to support herself and her son, Carol soon realized the value of an education. She went to college on a state vocational rehabilitation scholarship and to law school on the Social Security benefits she received after her former husband died. There were times when Carol could not afford to eat. Remarrying before graduating from law school, Carol soon had two daughters. She opened a private law practice in Decatur in 1977 and, spurred on by a trial judge who repeatedly called her “little lady” in open court, Carol decided to run for the bench. She defeated four men and in 1984 became the first woman elected to the DeKalb County Superior Court. She has served on the Georgia Supreme Court since 1992. Judge Workman was a remarkable woman, lawyer and trailblazer and I consider myself fortunate to have become her friend during the years she served on the State Bar Board of Governors with me. And it is not just women trailblazers out there to whom we owe a debt of gratitude. There are many progressive men who have helped make the road smooth for those coming behind them. Justice Robert Benham- Justice Benham distinguished himself as the first African American to win statewide election in Georgia since Reconstruction. In 1989, Justice Benham was further distinguished as the first African American to serve on the Supreme Court of Georgia, following his appointment by Governor Harris. Sr. Judge Horace Ward- In 1979, Judge Horace Ward became the first African American federal judge in Georgia, having been nominated by President Jimmy Carter. He had previously served in the Georgia State Senate and as a State Court and Superior Court judge in Fulton County. Since 1993, Judge Ward has served the Northern District of Georgia in senior status. He is also well known in Georgia history from his efforts to gain admission to the then-segregated University of Georgia Law School in the 1950s. For years, the Board of Regents denied Judge Ward admission to the law school, stating that the fact that no black had ever been admitted to the university was merely coincidental. Meanwhile, the Board of Regents decided to “modify” the admissions criteria by requiring that candidates take an entrance exam and that they get two additional letters of recommendation—one from a UGA law school alumnus and the other from the superior court judge in the area where the applicant resided. Judge Ward filed suit against the Board of Regents to gain admission, which, after years of delay, was eventually dismissed on the basis that Judge Ward had “refused” to reapply under the new admissions guidelines (which Ward’s attorneys had argued was yet another ploy to keep Ward out). Judge Ward decided not to appeal and attended law school at Northwestern University, from which he graduated in 1959. In what can only be described as poetic justice, Judge Ward was a member of the legal team representing Charlayne Hunter and Hamilton Holmes when they were admitted as the first African American students at UGA, thus ending 175 years of segregation at the university. And tonight we honor another trailblazer, Judge Clarence Seeliger. Judge Seeliger, as you have heard, was a trailblazer for racial justice and equality. He hired the first African American employee of DeKalb County State Courts and courageously removed the Confederate flag from his courtroom at great personal risk. Judge Seeliger made it clear that no one, not even judges, was above the law. Judge Dr. Martin Luther King, Jr. said, “There comes a time when one must take a position that is neither safe, nor politic, nor popular, but he must take it because conscience tells him it is right.” Seeliger’s life embodies that principle and I consider it a privilege and highlight of my year as State Bar President to be speaking tonight, a night in which we honor Judge Seeliger. I often wonder whether I would have the same courage of Judge Seeliger and Judge Ward and other progressive Americans to stand up against racial inequality had I been an adult during the Civil Rights Movement. I like to think I would have been right there alongside the Freedom Riders, or walking across the William Pettus Bridge, but admittedly, it is daunting to consider risking one’s life for something you believe in. I like to think I would have done that. I suppose the social justice issue that presents itself to me now in my career is that of equality regardless of sexual orientation. I have delivered speeches on this issue, I have walked in the Pride Parade with my husband and two children, and I have even filed for a pardon of a United States Veteran who was court-martialed for being gay. I will continue to fight for social justice for all regardless of sexual orientation…but I’m not risking my life to do so, the way Judge Ward and Judge Seeliger and Justice Benham for racial justice. Those trailblazers are pretty inspirational aren’t they? There is no question things are different now for many of us than what they were for Justice O’Connor, or Chief Justice Hunstein or even for me for that matter, not only in the legal profession but in all professions and corporate America. Yet, we have constant reminders that we have to do better. For example, during a school’s recent visit to the Journey of Justice, a Bar employee saw a young African –American child looking at the photographs of the Past Presidents on the wall of the 3rd floor with his father who was there on the tour. The employee heard the young child say “There isn’t anyone who looks like us, Dad.” That hurts. We have over 10,000 children walk through that 3rd floor hall every year, and they observe, they notice, and I don’t want anyone of them to go home thinking the State Bar of Georgia doesn’t have a photo of a leader who looks like them. While our State Bar is comprised of 34 percent women, I am only the second woman President in its history, and I am the only President also to be a mother. In my opinion, diversity of leadership – with proportional representation reflecting the makeup of any organization – is a key to its ongoing health and strength. When the leadership of an organization is truly representative of the membership, the members more readily support the organization and are much more committed to it. I believe diversity in and of itself is a positive desired thing because it allows all points of view to be heard and considered. It makes one stop and reconsider the framework through which you view all issues and makes you actually take a minute and put yourself in someone else’s shoes before reaching any decision. I just recently saw a new survey from the National Law Journal about women partners in large law firms. It’s not that encouraging. It showed that today about 18.8 % of all partners, equity and non-equity, are women. That is up only 2.8% over the last 10 years. If we just look at women equity partners, that number has been fixed at 15% for the last 20 years. This National Law Journal survey also proved that if a law firm has two tiers of partnership, an equity tier and a non-equity tier, women are more likely to be placed on the non-equity tier than men. The survey showed that women make up 17.6% of equity partners with only the one-tier track but throw in a non-equity tier and the women who are equity partners in firms with both tiers comprise only 14.7% of equity partners. Some say acceptance of women as equals in the legal profession is a matter of culture. That may be…but I feel like it has to be more intentional than that, with women, with minorities, to make our profession more inclusive. As a mother of a 17 year old son and a 15 year old daughter, I am extremely cognizant of the example I set for them professionally and personally. You never know who you might influence. A Young woman at Athens UGA said she was definitely going to law school after hearing my speech to the State Court Judges. In a trial earlier this year in which I represented parents of a 23 year old young woman who had been killed in a car wreck, their other young daughter, in tears at the time, told me after the trial she had decided she wanted to go to law school. There is no question we are making strides in Georgia. For example, the State Bar just recently hosted a reception honoring Judge Carla Wong McMillian’s appointment to the Georgia Court of Appeals. It was an historic appointment by Governor Deal in that Judge McMillian is the first Asian Pacific American state appellate judge ever in the Southeast and we congratulate not only Judge McMillian but also Governor Deal. In his wonderful remarks that evening, Judge Al Wong said we must remain vigilant and steadfast in the quest for diversity. That is so true. But it’s really not enough simply to talk about it. Or complain about it. If you want to realize more diversity in our courts, in our Bar leadership, in our State leadership, you must get involved at the ground level. Last week I moderated a panel on Judicial Diversity at the University of Georgia Law School. Panel Members included Georgia Supreme Court Justice Harold Melton, state Court of Appeals Judge Anne Elizabeth Barnes, Athens-Clarke County Chief Magistrate Judge Patricia Barron. The subject matter was judicial diversity. Justice Melton made the point that for the bench to reflect more diversity, more minorities must get involved on the ground level with various organizations so that when an appointment becomes available, these individuals are already well known. “There’s a lot of discouragement in the African-American community about working with Republicans. I saw that in the governor’s office first-hand,” Melton said. The only time the governor heard from African-American lawyers or bar associations was when a judgeship came open, he said; meanwhile, other lawyers and organizations had been working to make contacts and establish relationships with the administration. Justice Melton was 100% right. I have told you I am only the second woman President of the State Bar of Georgia, but do you know how many women have run for that office since Linda Klein was the first female president? One. Me. Former Georgia Chief Justice Leah Ward Sears wrote for the Daily Report last year decrying the lack of diversity on the bench. Of 464 judgeships statewide, wrote Sears, about 100 were occupied by women, 53 by African-Americans, and—at that time—one was Asian and one Hispanic. But how many African-Americans and how many Hispanics and Asians put in an application with the JNC? How can we demand the JNC recommend a short list comprised of only minority nominees to the bench if those applicants are totally unknown to the Commission members because they have never been involved in any local bar association, or any political effort? Women and minorities must get involved in professional and political efforts to build those necessary relationships. Women and minorities must offer themselves for the bench and for leadership positions or we will never achieve the diversity we say we want. Which brings me to my closing thought…and it is often my closing thought in every speech I give…and that is “A Rising Tide Lifts All Boats.” This is literally written on the wall of my office. I believe it and it is that philosophy of mutual good and shared connections that has directed my entire career and my work on behalf of the Georgia State Bar. We are all in this together, and we must encourage one another and cheer each other on. By doing this for others, we will lift up ourselves unknowingly in the process. The more you help someone else the more you help yourself. The less you think of yourself, the smaller your problems become. We must work together to remove barriers to inclusiveness. Each time a barrier is removed in the leadership of our courts, our Legislature, our profession, a door opens to a new generation of potential great trailblazers, which might include the next Horace Ward, the next Sandra Day O’Connor, the next Robert Benham, the next Leah Ward Sears or the next Clarence Seeliger. And that is something to be celebrated. Thank you again for your support. I hope you will remember that the State Bar of Georgia stands as a beacon to promote the cause of justice, to respect the rule of law and to protect the rights of all citizens of the State of Georgia.